The Nest will be published on March 22, 2016 by Harper Collins publishers. The Nest is a bit of a wild and honestly written portrayal of a very dysfunctional family and other characters connected to the Plumb family in one way or another. I almost stopped reading half way through the book, but I had to know what was going to happen to each of the characters. “The Nest” is the name that the P lumb family refers to their rather large inheritance which they will receive when the youngest sibling, Melody, turns 40, a date which is on the near horizon. However, the Plumb matriarch decides to dip into the inheritance to bail out Leo Plumb, the brother that is always in trouble but everyone loves. As you can imagine, this doesn’t set well with the other three siblings who have been counting the chickens before they hatch with the Nest and have it mostly spent before they receive it. Money can’t buy happiness…but can family ties lead to happiness? The author did a brilliant job of keeping the story moving forward while switching between past and present, and also switching back and forth between many different characters, including all 4 adult, Plumb siblings. Other characters who played a big role were the two Plumb grandchildren, Jack Plumb’s husband, Melody Plumb’s husband, Leo Plumb’s girlfriend, and Bea Plumb’s boss. It was interesting how there were other characters who weren’t really connected to the Plumb family as much, but their stories were told throughout the course of the story as well. There really isn’t any suspense, heavy romance, or comedy in this story. It is mainly a story of family and the crazy relationships between family and friends. I’m glad I finished the book, and really enjoyed it. This book is set to be published on September 29, 2015. I raced through this book so quickly because the story line was fast-paced even though it jumps back and forth between past and present tense. It is definitely a nail biting, up-all-night-after-reading kind of scary suspense novel. Karin Slaughter has an uncanny knack of giving the reader the chills while also making he or she want to keep reading for more chills. There were a couple of plot twists in the book that were pretty shocking, but well worth it. The violence and description of such is pretty gory, so I wouldn’t advise reading if you do not handle that kind of thing very well. I won’t give many details as to the plot or synopsis of the book, because it becomes apparent rather quickly in the first few chapters. The craziest thing about this story is that one of the sisters was married to a man for almost 20 years and knew absolutely nothing about his actual lifestyle and killer instincts. Very creepy. I’ve read all of Karin’s book so far, and this is one of my favorites, despite that fact that I was up thinking about it far after I had finished the last page. Trust me; this is way better than a scary movie or a creepy episode of Dateline! A Million Miles Away is a heartbreaking but awesome story. I’m s o glad to have read it, even though I knew from the synopsis that there would be quite a bit of sad parts. The author has a knack for capturing the raw feelings of the character, including feelings of grief, anger, loss, guilt, betrayal, and love. Kelsey Maxwell and her sister, Michelle, may be identical twins, but that is about all they have in common. Michelle is artistic and spends her time being creative and quiet. Kelsey is a dancer who enjoys being the life of the party with her boyfriend and friends. Michelle is pretty tight lipped about any romantic interests, especially to her twin sister. Kelsey happens to meet Michelle’s current boyfriend, Peter, the weekend he is due to be deployed to Afghanistan. Tragically, Michelle is in a fatal car accident on her way home from the airport, leaving behind Kelsey and her parents to pick up the pieces. No one in the family but Kelsey knows about Peter, and she has no way to find him to tell him about Michelle. One day she happens to see a Skype call coming in from Peter (meant for Michelle, of course) and she picks it up. Talking to Peter (as her sister) somehow helps her cope with her grief and sadness, and seems to help Peter get through the stressful days in battle in Afghanistan. She plans to tell Peter the truth, but finds herself falling for him and soon she cannot bear to break his heart. As you can imagine, such a sticky situation cannot end well. The author did a great job of ending the book, however, without tying everything in a neat little bow. I would highly suggest this book for teens and adults alike. It’s a very sweet story which shows that even from a tragedy, love can and will endure. I’m a big fan. What a fabulous story this was! I devoured this book in one evening like a bottle of wine with a good friend. Actually, the story takes place on a vineyard in Sonoma County, California, so it really did give me the taste for a great glass of vino. A week before her wedding to brilliant and heart-stoppingly handsome architect, Ben, Georgia Ford leaves her life and job as a lawyer in the city and heads home to her family’s vineyard, The Last Straw Vineyard, in Sebastopol, California. She expects to get home and seek comfort of her older twin brothers Bobby and Finn, as well as her happily married parents. However, when she arrives home running from secrets Ben had been keeping from her, she realizes that there were even more secrets being kept from her by the family. The romantic scenes are sweet and not too overdone. The descriptions of the vineyard and of winemaking is beautifully done. One of the neatest things I found was that The Last Straw Vineyard is a small biodynamic vineyard which holds its own up against the large commercial vineyards in Sonoma County and Napa Valley. Georgia’s father Dan, the head winemaker, doesn’t add anything to the grapes to make wine, he lets the grapes make themselves into wine. It’s all about the different vegetables and flowers that are composted into the soil to make rich, robust grapes which will turn into wonderful vintages. 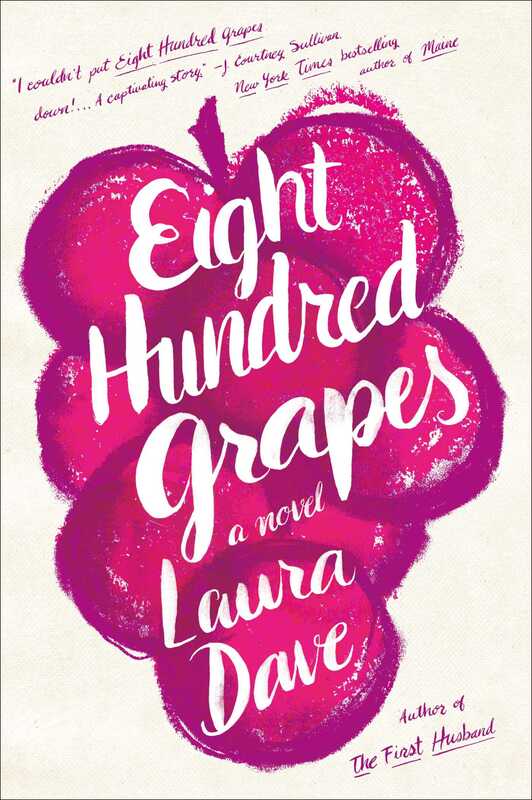 Let’s just say that this book caused me to appreciate wine and all eight hundred grapes that go into the making of every bottle. I would highly recommend this book because I absolutely loved it. I’m so glad to have read this book. It reminded me a little bit of Kristin Hannah’s The Nightingale, which is also a beautiful WWII story that I have reviewed previously. I had no idea that during WWII, German prisoners of war were used for farm labor in the states, while many of the American farmers and their sons were fighting in the war. The Cherry Harvest takes place in Door County, Wisconsin, home to many cherry orchards. The Christiansen family’s young son Ben is away at war, leaving a teenager Kate, mother Charlotte, and father Thomas to work the orchard without any workers available, as in years past. Because of the war, food and many common luxuries (such as coffee and scented soap) are scarce and if the orchard isn’t harvested and tended, the Christiansen family might not be able to keep their farm running. They decide to allow German POW’s to work on the farm, against the wishes of many of the other townspeople. Thomas befriends one of the POW’s named Karl, a teacher who is well versed in English and appreciative of the Christiansen family allowing him to live and work on the property. As Karl tutors young Kate and becomes closer to Thomas and Charlotte, decisions are made that will forever impact the family. Meanwhile, young Kate starts a secretive relationship with a rich son of a political figure. When the family receive news of the long awaited return of their son Ben from war, the story unfolds quickly and sadly. Be prepared for a heart-wrenching ending. Even with the ending being sad, I really got lost in this story. The writing was beautiful. The author described the cherries and all the things on the orchard in vivid detail, making it seem like the reader was there seeing everything in person. The story has just the right amount of romance, humor, suspense, and heartbreak. You won’t be sorry for reading it!